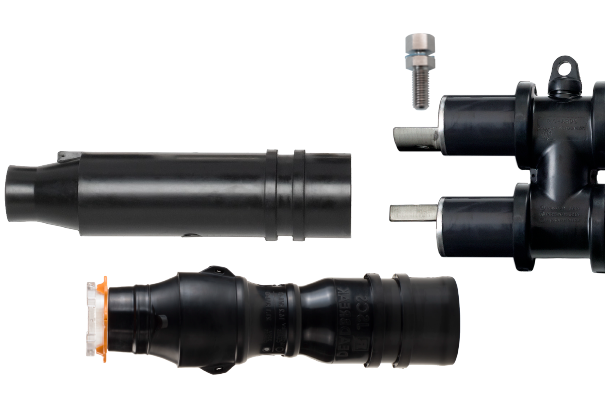 The Richards Disconnectable Joint system is a multi-way medium voltage splicing system available through 35kV. Commonly found in higher load density underground systems, these Joints can be useful even for lighter loads due to their versatility and simplicity. Other methods involve complicated installations that are extremely difficult in congested underground distribution environments. The JSCS Series Cold Shrink Sleeve is a major breakthrough in Disconnectable Joint technology. This 3-in-1 range-taking design significantly eases installation and eliminates the need for a Cable Adapter, Jacket Seal, Retaining Ring and Vent Rod. The JSCS Series is molded from Richards’ Cold Shrink EPDM formula which is manufactured by our rubber production division. Equipped with a rugged, oil-resistant EPDM exterior, the Cold Shrink Sleeve is built to last in the toughest environments.